What happens when you get a bunch of video marketing gurus in the same room? Social Media Marketing World, of course! 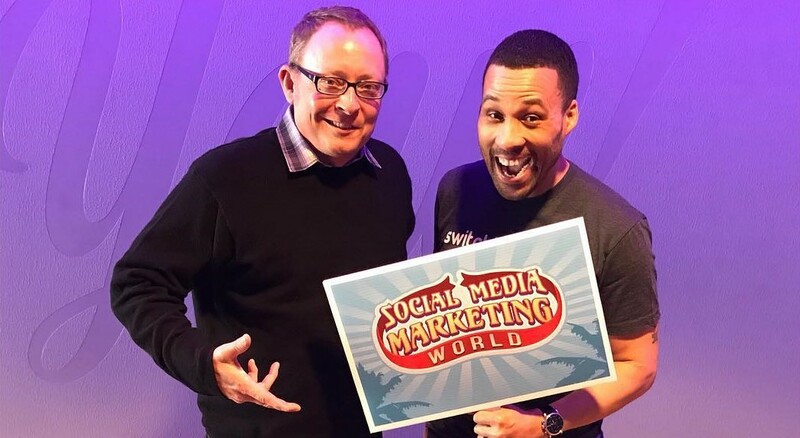 Switchboard ran into some live streaming legends at #SMMW18 earlier this month, and we just HAD to pick their brains about what they’re up to these days, the state of live video content, and how they’re using Switchboard Cloud to fuel their digital marketing strategy. Presenting our brand-new series: Switchboard Spotlight! Our first victim was none other than Todd Bergin, better known to his thousands of followers as Todd.LIVE. Todd is the live video pro behind the Entrepreneur Live Video and ‘Grammer School podcast, as well as Slam Dunk Studio. He’s also a longtime Switchboard user, relying on our all-in-one live streaming platform to broadcast across multiple channels with a single input. We sat down with Todd to get to know him and his product better, what his top tips for live streamers are for handling a broadcast gone wrong, his thoughts on the future of Snapchat and content marketing, and so much more! Here’s what we learned. Multicasting is the future of digital marketing, and brands are slowly beginning to realize that they need to be everywhere if they want to effectively reach and engage with their audience. Todd was inspired to join the multicast revolution by serial entrepreneur and CEO of VaynerMedia, Gary Vaynerchuk. It was the Super 8 campaign that made Todd realize that he wanted to be able to be everywhere. Even if he didn’t always go everywhere, Todd was determined to learn how to do it, have the equipment to make it happen, and make as professional of a production it could be. What Makes a Live Stream Engaging? Good Audience Participation \ It’s always important to acknowledge your audience and give them something to meaningful to engage with. Good Subject Matter \ A broadcast needs to capture the viewer’s attention in a way that encourages them to stick around for the full broadcast and come back for more the next time you go live. Good Location \ Todd recommends going live in a more in-the-field environment, where you can “build in some surprise” that makes viewing the video as enjoyable as listening to the video. What Made Your Live Stream With Owen Video & Nick Nimmin so Memorable? What Should You Do if Something Goes Wrong During a Live Stream? Live streamers are people, and people make mistakes. Your audience, Todd insists, understands this and so should you. “Things happen, and you just have to roll with it,” says Todd, noting that he often has issues with a leaf blower going off outside while he’s live, and he just has to trust his audience to forgive him for not being Spike Lee. Why Should You Use Switchboard Live? While there are plenty of myths about live streaming, there’s also plenty of challenges in the world of multicasting. Todd himself calls it an artform. He finds Switchboard to be especially helpful in the post-production process. And that’s all the time we have this week, folks! Make sure to check out Todd’s podcasts and sign up for a FREE TRIAL of Switchboard Cloud. We’ll be back soon to share another interview with movers and shakers from the live streaming industry in the next installment of our new Switchboard Spotlight series!